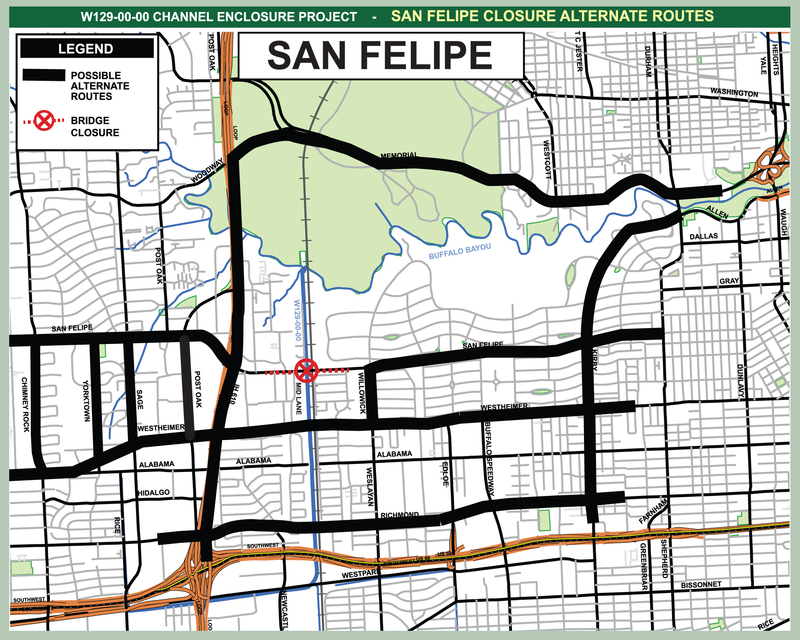 In approximately two weeks, or on September 22, 2013, the Harris County Flood Control District will close the San Felipe Street bridge located at the railroad tracks just east of Mid Lane inside West Loop 610 in the Galleria area. The bridge will be closed to all traffic for up to two weeks while the 50-year-old bridge is demolished and replaced. Crews will be working extended hours to expedite completion and minimize inconvenience. Please note: Road closures and construction schedules are subject to change. The Flood Control District will notify the public if there are modifications to this schedule. If their ultimate destination is not in the area, motorists are encouraged to avoid the area while the bridge is under construction and to use an alternate route. Possible alternate routes include West Loop 610, Memorial Drive, Westheimer Road, Richmond Avenue or Kirby Drive. Signs announcing the street closure dates will be installed in the area prior to the closure. Motorists are encouraged to be alert, to pay attention to all posted street and lane closures and to take an alternate route. The San Felipe bridge closure schedule is subject to change due to construction or weather issues. The Flood Control District appreciates the community’s patience during the bridge closure project and regrets any inconvenience caused to residents, business owners and motorists in the area. The San Felipe bridge replacement is part of the Flood Control District’s $13.2 million W129-00-00 Channel Enclosure Project, which is rebuilding and enclosing the poorly functioning drainage channel formally identified as HCFCD Unit W129-00-00. The work spans the section of W129-00-00 from San Felipe to Richmond and includes enclosing the drainage channel with dual 12-foot by 10-foot reinforced concrete box culverts and replacing the bridges at Westheimer and San Felipe. The Westheimer bridge replacement was completed in April 2013. The City of Houston is contributing funds to the bridge projects. For more information about the project, visit the W129-00-00 Channel Enclosure Project webpage at www.hcfcd.org/W129. If you have questions or comments, please call the Flood Control District’s Project and Study Information Line, which is monitored daily, at 713-684-4040.